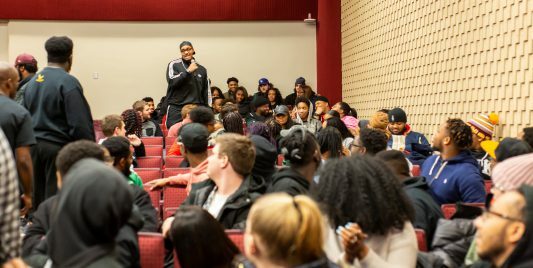 Two multicultural organizations collaborate for their version of a popular television show | Grand Central Magazine | Your Campus. Your Story. 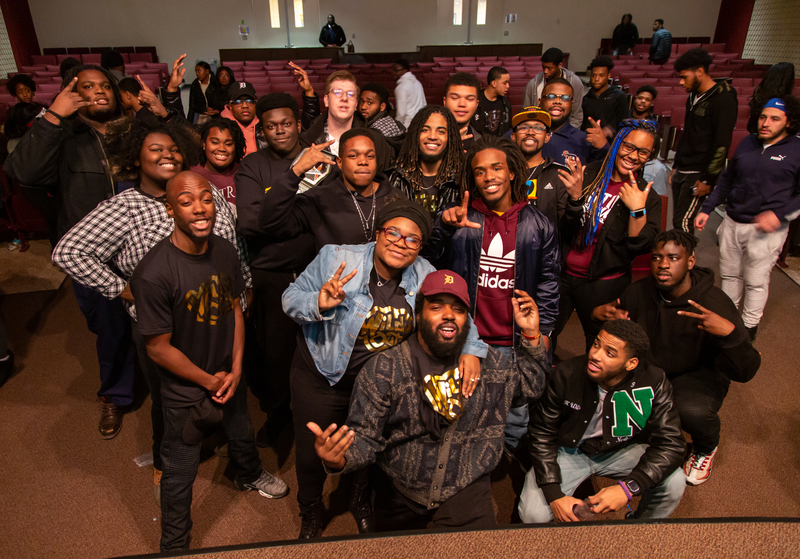 Justus League and the Organization for Black Unity (OBU) held their version of Nick Cannon’s Wild ‘N Out, a popular television show filled with improv comedy, one on one joke battles and freestyle rapping. Ayinde Pulliam celebrates as he gets a bell for a point with his freestyle against OBU. 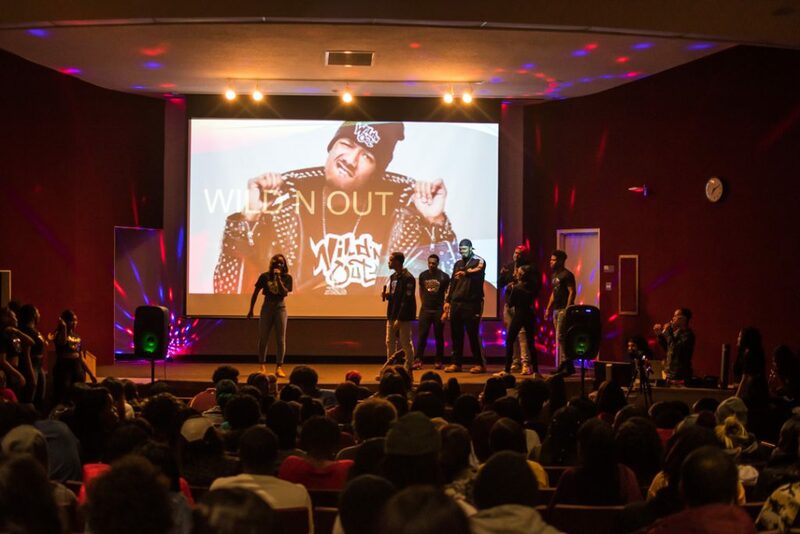 The two organizations performed their, “Wild’ N Out” at the Anspach auditorium, where they had majority of the venue filled with viewers. The two organizations were split into two teams for the event. Justus League represented the Gold Squad while OBU represented the Platinum Squad. Detroit junior, Bishop Bent, was one of the performers for OBU. He said he had a good time at the event. Bishop Bent holds the mic as he interacts with an audience member during the, “Family Reunion” bit of the show. St. Louis, MO sophomore, Elijah Hankerson, is the Event Coordinator of OBU and helped out with the behind the scenes preparation as well as supported his fellow members. He said this is his first executive board position in an organization and he liked the experience. A member of OBU tries to,” spit his game” at one of the Wild ‘N Out girls during the game bit,” Let Me Holla”. New Haven senior, Taraj Livesay, one of two Vice-Presidents of Justus League performed for the organization. As an avid performer and rapper with the organization, he felt comfortable on stage and was one of the biggest point scorers from both teams. 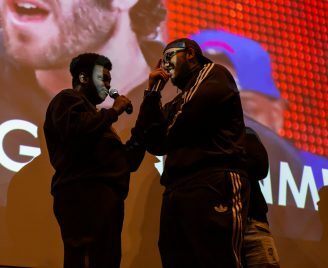 Taraj Livesay (left) “roasts” Bent during one of the Wild N’ Out bits. Livesay was on-fire during this event as he single handedly beat OBU’s Platinum Squad during this round. “The event was great. We went up and surprised the crowd. Had good games, had a lot of good jokes, bad ones too, but that even happens on the show. All-in-all it was fun to be a part of,” Livesay said. Livesay said their preparations consisted of trying to anticipate large crowds for jokes to reach them, practicing the week before, rehearsing, and then going for it. Overall, he said he was happy for the organization for winning the competition. The presidents of both organizations said they were happy about the performance and be happy to collaborate again. Detroit senior, Niya Townsend, is the president of OBU. She said she felt the event went well. “It’s kinda sad that my team lost but it’s okay because everyone seemed to have fun, the crowd was participating, laughing and joking so, I think it was pretty successful,” she said. Townsend said she likes collaborating with Justus League because of the cooperation between the two organizations. Detroit senior, Ahsha Davis, has been Justus League’s president for the three years. She said the past few years, her organization has been collaborating with OBU on multiple events. Davis said the event went well even with the challenge of emulating the show. The members of Justus League pose for a celebratory photo after their win against OBU. 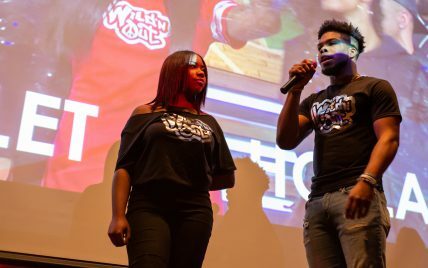 Davis said her favorite part of her last Wild ‘N Out was seeing the crowd interaction between both organizations. 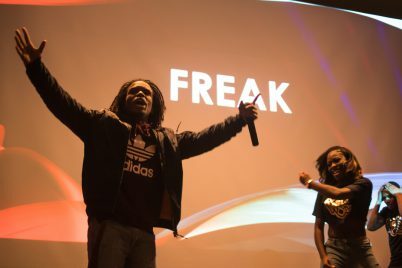 Separator image Posted in Arts & Entertainment, Events, Events, Pop Culture, Student Lifestyle, Students, Students and tagged with Anspach, Justus League, Kyle Tanner, OBU, organization for black unity, Wild 'N Out, Xavier Mendoza.